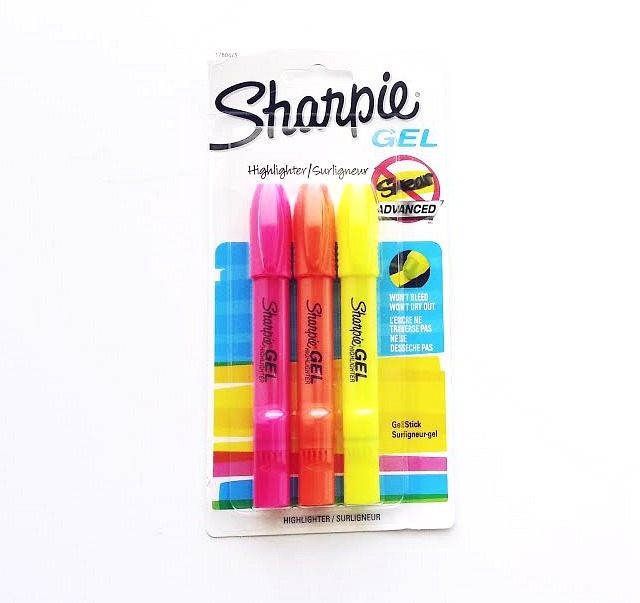 Gel Highlighters are my new "thing"
As I was making my usual beeline to the Office Supplies section, I spotted these Sharpie Gel Highlighters. Not sure why I never noticed them before. 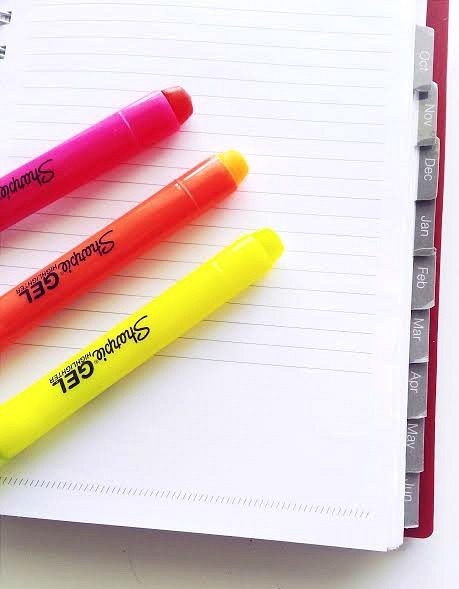 It could be that they're a new product, or it could be that my eyes have been trained to just scout out new notebooks and not the pens and markers, but whatever it may be, I'm so glad that I came across them. The 3- pack I picked up came with these neon colors- pink, orange, and yellow. The gel is similar to a waxy crayon texture and has a twist bottom to expose more of the highlighting stick. I did a little sample swatch here to show you that there was no smearing or smudging with these babies. And best of all, I don't have to worry about any bleed-through, which has been somewhat an issue when working with other highlighting ink. I tested out 5 different pens that I use on a regular and a pencil. No smudging! 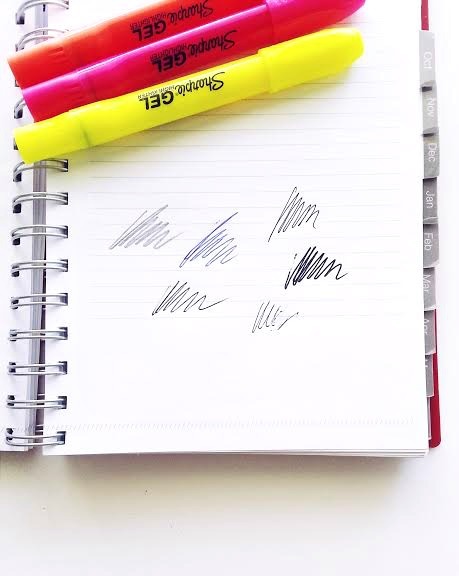 The only thing, though, is being that the highlighters are a waxy texture, it's almost impossible to write over them. So anything written that needs to be highlighted must be done first then highlighted after. Also, the tip is a little chunky, so it's not the best when trying to highlight thin lines and sections, but over all, I love these! 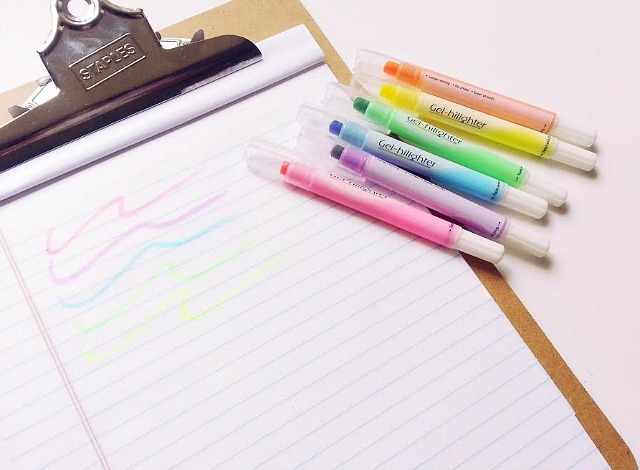 Now if you're ever in Walmart's stationery section, you might be able to find these gel highlighters that are cheaper than the Sharpie's and with more color variety. They work just as well. I noticed that not all Walmart locations carry them, but you can order them online here. * And for all of you Hobonichi planner fans, the textsurfer gel (which was in my shopping cart) is currently out of stock, but that's okay. I imagine that they work just as well as these and with half the cost. 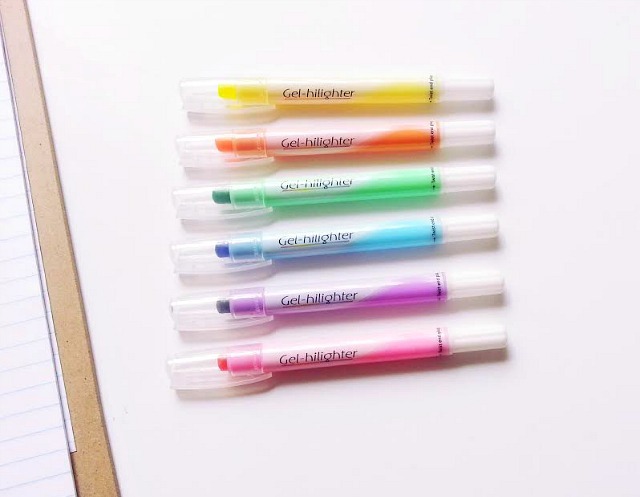 What are is your favorite highlighters? I'd love to know! 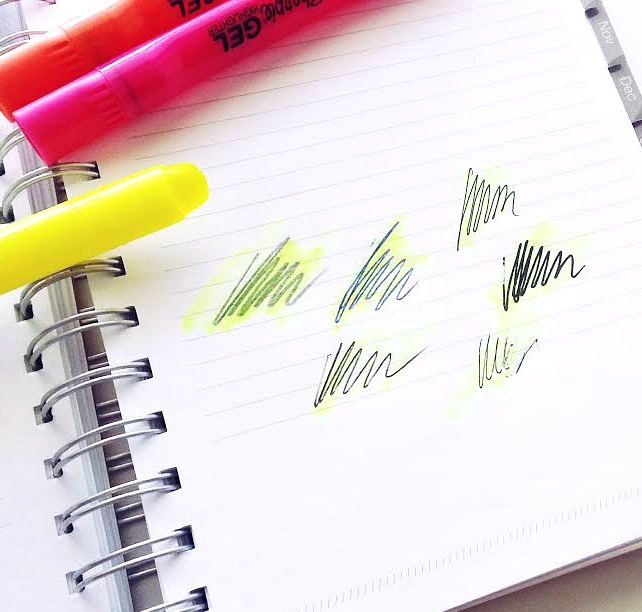 I hate when highlighters smudge! Hi Natasha! Right?? I know. And then it's worse when the ink bleeds through onto the next page. This has happened a few times when I had to prepare work documents. Not a pretty sight.